Hyderabad: His homeland forced him into exile and his host country is threatening to deport him but Syedullah Bashar is hopeful that one day justice will be his – and his community of Rohingya Muslims. As the world debates the plight of Rohingya Muslims, forced to flee their homes in Myanmar's Rakhine state, Bashar is hoping desperately that the Indian government does not deport them. "We have not come here to create any problems. Please don't treat us as terrorists," he said. The makeshift hut in a Rohingya migrant camp is home for him and his family. "Nobody wants to be a refugee. We had to flee Myanmar as the government committed genocide. Once normalcy returns, we want to go back to our country," said the 27-year-old father of two. Bashar ran a stone business in Myanmar and now works as a labourer, eking out a precarious existence with his parents, wife and two children. Caught in the global spotlight of an escalating humanitarian crisis, Bashar is one of the thousands of Rohingya Muslims - described by the United Nations as the most persecuted minority in the world - staying in India. 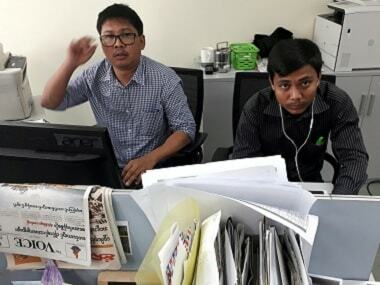 While the government estimates there are 14,000 Rohingyas in various places across the country, aid workers say the number is closer to 40,000. Hyderabad is home to an estimated 3,500-4,000 Rohingyas staying in camps in different parts of the Old City. About 3,500 people are registered with the United Nations High Commissioner for Refugees (UNHCR). Some of them came in 2012 when violence broke out in their homeland. 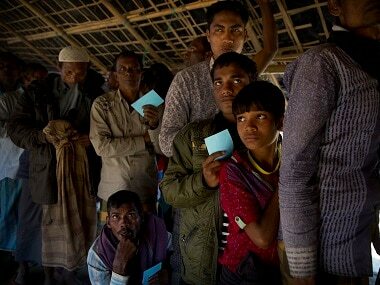 Their worries have compounded since the government this week told the Supreme Court that Rohingya Muslims are illegal immigrants and their continued stay posed "serious national security ramifications". 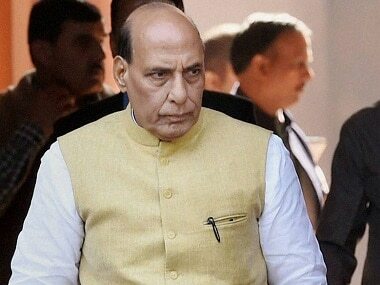 Today, Union home minister Rajnath Singh added that they were not refugees who had sought asylum but illegal immigrants who would be deported. "We also wish to go back to our motherland. If the world supports us, we are hopeful of going back. Won't you be heartbroken and cry if you are forced to leave your country," said Abdul Karim. "We are poor people. Whatever work we are offered, we do it. Due to violence in Myanmar, some of our own family members and relatives are not with us. Some fled to Bangladesh, some to Indonesia, some others to Sri Lanka, Malaysia, Saudi Arabia and some also to Dubai," said the 20-year-old who works in a local hotel. Bashar added that the government could check all the places that Rohingyas were staying in across India and punish those found guilty of doing anything related to terrorism. "We Rohingya refugees are forced to stay in different parts of the world. The army in Myanmar has a policy of subjecting us to atrocities. We are hopeful that equal rights will be restored to us," Bashar said. Describing India as a "superpower", he requested the Indian government to allow them to stay till the community got equal rights in Myanmar. Sultan Mahmood, 65, echoed him. "We have no links to terrorists. We have come here because we feared for our lives...we are not a threat to anyone. The government here has helped us a lot. We have got shelter and doing whatever work we get. Police regularly come to our camps for checking. We got refugee cards due to the government's help. We want the Indian government's support." Police, they say, pay regular visits to the camps and keep tabs on the community. Expressing solidarity with the Rohingya Muslims of Myanmar, some city-based organisations have held protest rallies here against the "genocide" of the community back home.